I got paid after I uploaded my driving license. I have got paid as usual, they also sent me email telling me that they started asking for ID proof and they will not process any payment to any one till he provides an ID proof. So guys, if you already have account on eLeavers make sure to login to your account and upload any one ID proof you have. Scammers. All the post are coming from Eleavers people trying to deceive you. You’ve been warned! It’s amazing guys. I never thought that earning from internet would become so easy for me. I have started earning now from eleavers. I got $ 467 from my blog. 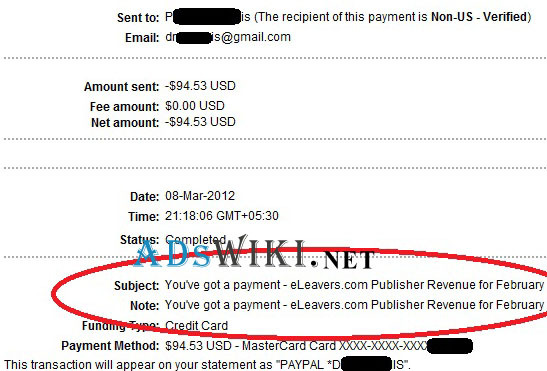 ELeavers is the best paying alternative to AdSense. I am getting timely payment. eLeavers is great for making money. If you have traffic, you can earn lots of money from here. I have got $ 745 this month without any work. I think eLeavers is not bad and StudAds is the best for making money. I am saying this as I am earning the good income from there.